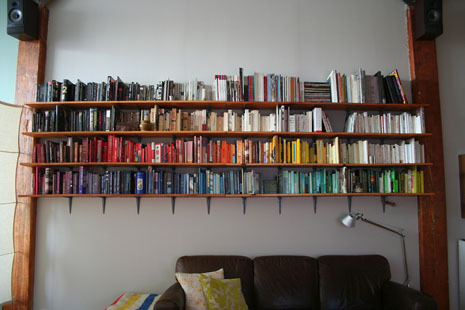 Book Bench explains it correctly when they call organizing your books by color “an exercise that feels dorky and juvenile.” But look, not (really) so! I guess the exposed wooden beams and built-in wall shelves help romanticize the whole nerdy practice. Killed book jackets from Print. Wanted: Baby Jesus’ head. For reasons too dumb to explain, this makes me think of summers in Iowa at the pool.